Primarily there are three types of shradhs – Nitya (Everyday), Naimittik (Occasional) and Kamya (Performed with an objective). In addition to these three types, Yamasmruti finds a mention of Nandi shradh and Parvana shradh too as the main types of shradhs. The shradh performed every day is termed as Nitya shradh. This shradh can be performed just by performing tarpan (Offering in a specific way) using water or tarpan using sesame seeds. Ekoddishta type of shradhs performed for the pitars fall under Naimittik shradh category. If a couple is not able to have a child or if the wife has frequent abortions, then for the fulfilment of the desire of the well-being of the foetus, perform shradh or tarpan of Bhishmacharya on Bhishmashtami, meaning, on Magha Shukla 8 (Eighth day of the bright fortnight of the month of Magha). 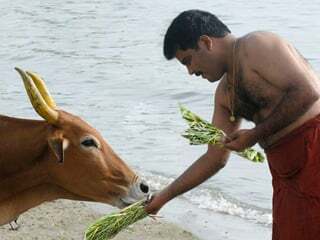 The shradh rites that are performed at the commencement of an auspicious ceremony, at the commencement of any of the 16 sanskars like garbhadhan, during a punyahavachan (Recitation of specific mantras for success of a ceremony) is termed as Nandi shradh. In this rite, Satyavasu (or Kratudaksha) are the Vishvedev and three past generations – pitrutrayi (Father, grandfather and great-grandfather), matrutrayi (Mother, grandmother and great-grandmother) and matamahatrayi (Mother’s father, grandfather and great-grandfather) pronounced. Karmanga shradh and Vruddhi shradh are Nandi shradhs. 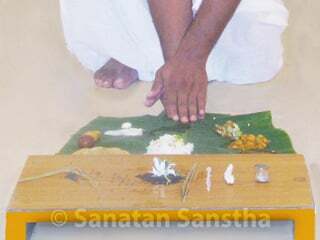 This shradh is performed during the sanskar of garbhadhan. This shradh is performed after the birth of a child. The pindapitru-yadnya (Sacrificial fire for the pitars) mentioned in the Shrout lineage is performed by a Sagnik (He who performs the ritual of Agnihotra regularly). An alternative to this is the Parvana shradh mentioned in the Gruhya sutras. Once the pitars get listed as parvanas, this shradh isperformed for them. Ekaparvana (Single parvana), dwiparvana (Two times parvana), triparvana (Three times parvana) are the three variations of this shradh. 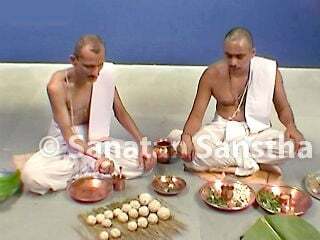 Mahalaya shradh and Tirtha shradh are types of Parvana shradh. Mahalaya shradh – This is a Parvana shradh performed on tithis starting from the first day of dark fortnight of Bhadrapad till the new-moon day. Matamaha shradh (Douhitra) – He whose father is alive, but not the mother’s father, should perform this shradh. This shradh cannot be performed before the annual shradh of one’s grandfather. Matamaha shradh can be performed only on Ashwin Shukla Pratipada. The performer should be over 3 years old. He can perform this shradh even if his thread ceremony has not been performed. Tirtha shradh – The shradh performed at Holy places like Prayag or at the banks of a sacred river is termed as Tirtha shradh. Apart from the main types mentioned above, there are 96 other types of shradhs namely, 12 Amavasya (New moon day), 4 Yugs (eras), 14 Manvantars, 12 Sankrants, 12 Vaidhruti, 12 Vyatipat, 15 Mahalayas, 5 Pahili, 5 Ashtak and 5 Anvashtake. Reference : Sanatan Sanstha’s Holy text ‘Shraddha’. Why should we chant ‘Shri Gurudev Datta’ the Name of Lord Datta ? When, where and by whom should Shradh vidhi be performed ? Jago ! Srilanka me bombblast ke liye 9 Pakistani giraftar ! – LTTE se ladate samay 35 hajar nirdosh Hinduon ko maranewali Srilanka ki sena Pak ko sabak sikhayegi ? जागो ! श्रीलंका में बमविस्फोट के लिए ९ पाकिस्तानी गिरफ्तार ! – लिट्टे से लडते समय ३५ हजार निर्दोष हिन्दुआें को मारनेवाली श्रीलंका की सेना पाक को सबक सिखाएगी ? Sixth month in the Hindu lunar almanac. First day in a Hindu lunar fortnight. Recitation of specific mantrās for success of a ceremony. Subconscious impression; Vēdic rituals to create subconscious impressions. A ritual performed before conception for the purpose of a good progeny. Seventh month in the Hindu lunar almanac. Last day of the Krushṇapaksha (Dark fortnight) of Hindu lunar fortnight, the new-moon day.